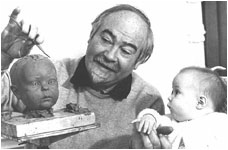 The sitter was the retiring Vice Chancellor of Nottingham University. 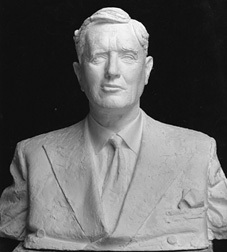 The University commissioned the bust shortly before his retirement as Vice-Chancellor, an office he had held from 1948 when the University was granted its charter until his retirement in 1965. The bust is housed in the Senate Ante-Chamber which is a meeting room within the Trent Building. Bertrand Leslie Hallward was born 24th May 1901 and educated at King's College, Cambridge, where he read Classics. After teaching briefly at Harrow, he was elected as a Fellow of Peterhouse College, Cambridge in 1923. In 1926 he was appointed as a Classics lecturer for Cambridge University. From 1939 he was headmaster of Clifton College near Bristol, but in 1947 he moved to Nottingham as the first Vice-Chancellor of University College, Nottingham. A royal charter giving full university status to the college was granted in 1948. Hallward remained as Vice-Chancellor until his retirement in 1965, and oversaw a massive growth in building development and the student population of the university. On 19 March 1965, Hallward had the honorary degree of Doctor of Laws of the University of Nottingham conferred upon him. In his retirement, Dr Hallward enjoyed sailing and historical research. The University Library at Nottingham was re-named the Hallward Library in 1989. He died on 17/11/2003. 'Bertrand Hallward, First Vice-Chancellor of the University of Nottingham: A Biography' (by Derek Winterbottom). Bertrand Leslie Hallward, classicist, schoolmaster and university administrator: born Hove, Sussex 24 May 1901; Fellow of Peterhouse, Cambridge 1924-39 (Honorary Fellow 1956); University Lecturer, Cambridge University 1924-39; Headmaster of Clifton College 1939-48; Vice-Chancellor, Nottingham University 1948-65; married 1926 Margaret Tait (died 1991; four daughters); died Cambridge 17 November 2003. 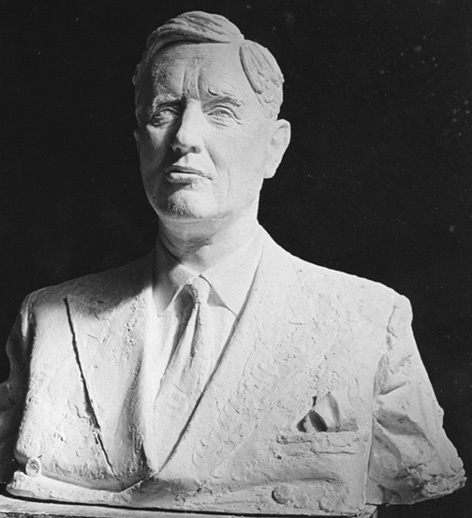 Bertrand Hallward was the first Vice-Chancellor of Nottingham University, serving the university from 1948 to 1965. He was a remarkable, able and ebullient character. The son of a member of the Indian Educational Service, Hallward was born in 1901 and sent to Haileybury, and then won a classical scholarship to King's College, Cambridge. His mother was a beautiful woman and he inherited her good looks: at university he was christened "the Babe". He acted Apollo in the Greek play, and later was often compared to a Greek god. He had a brilliant record in the Classical tripos and at tennis was on the fringe of a Wimbledon standard. He also made difficult ascents in the Alps with the economist A.C. Pigou who became a close friend, and was on the list of possibles for the Everest exhibition. Later, in the Alps, he fell down a crevasse but stayed among us because a teenage daughter sat on the other end of the rope. After graduating with a double first, he spent a year studying at the British School at Athens and worked with Carl Blegen, the excavator of the Linear B tablets. He walked all over Greece, sleeping on planks in huts or monasteries. In 1924 he did two terms' teaching of the bottom form at Harrow. Among the pupils was Prince Chula of Thailand who in his autobiography expresses gratitude to Hallward for making him write English properly. In October 1924 he became a Fellow of Peterhouse, Cambridge, and in charge of Classics. He wrote good chapters on the Second Punic War for the Cambridge Ancient History (Vol VIII, 1930), and gave lectures which were much sought after. All his spare time he dedicated to what he called his "mania for physical exercise" - frequent golf with the professor of ancient history, hockey and tennis for the MAs, swimming in the Cam during the lunch hour, and, when it froze, waltzing with his wife on the fen ice. The classical teachers in Cambridge were dismayed when early in 1939 their brilliant young member accepted the headmastership of Clifton College. Hallward always felt that he wanted to be more of a teacher than a researcher. His time as headmaster was overshadowed by the dangers of the Bristol blitz. He moved the school to the hotels of Bude in Cornwall. Arrangements were spartan but the record of scholarship improved. He was determined that, despite the war, every side of an educated life should be present, including music and art as well as games. In 1947 the University College of Nottingham was becoming a full university and offered Hallward its first vice-chancellorship. It was a good time for universities, with many mature people from the services eager to get on with a missed education, as well as many others from the Commonwealth on British Council scholarships. Hallward's first meeting with the student leaders was characteristic. They said that they had come to "negotiate"; he replied that he never understood that vice-chancellors were negotiators. Articles complained that the university had a headmaster rather than a vice-chancellor. One night at 11pm, 300 students danced round the Vice-Chancellor's house singing "Death to the Vice-Chancellor! When the day of red revolution comes we'll string him up." They were pained at his notion of "a community of scholars" when it meant that they could not have their separate Union building - because he wanted it open to everyone. This was the Portland Building, now regarded as one of the best university buildings since the Second World War. His method of government was unique among vice-chancellors and was only possible because he had a vast campus and everything to build on it. He was christened "Tigger", as he bounced about full of enthusiasm, taking an interest in everything and jollying the reluctant into doing something. It was said that he had a new idea every few minutes and some of them were better than others; he consulted everyone on what to do but took no notice of what they said. The staff and students were at times not sure that they wanted a vice-chancellor who devoted such amounts energy to their interests, thinking they might prefer a more restful life. There was a big row when he refused to let the students have a bar - but that was a veto which not even he could maintain. In retrospect Hallward came to be seen as one of the great university builders of the 20th century. He was determined to provide adequate residences: eight new halls of residence were constructed on campus between 1962 and 1966. He took a lot of trouble to ensure that the wardens of the halls were scholars, and believed in furnishing accommodation well because students would take better care if they were pleased with their room. He had a desire that the sciences should develop strongly, but an equal desire for the arts subjects, including classics, the history of art, theology and music. He also drove the university into having an art gallery. His great service financially was to win the admiration of Sir Cyril and Sir Humphrey Cripps, who became major benefactors of the university. Nottingham was perhaps the only university where on visits to the University Grants Committee the vice-chancellor was accompanied by his chairman of council, in the hope of restraining his enthusiasm. But Hallward was greatly respected as a leader by the then head of the University Grants Committee, Sir Keith Murray. 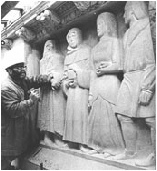 Privately Hallward made a generous, anonymous donation for the benefit of the university chapel, though to his regret he could not profess himself an orthodox kind of Christian. His wife, Margaret Tait, had the kindest nature and was universally popular; this helped his work greatly because it softened the vexations that arose from such a driving force. He retired in 1965, not content with the recommendations of the Robbins Report, and because he had a longing to return to the Greek and Roman Mediterranean. He had a boat built and for 10 years he and his wife spent the summer months in the little harbours and archaeological sites of the Greek Islands or Sicily or Malta. In the winter he lived at Aldeburgh. But as they both aged they went back to a flat in Cambridge. After his wife's death, Hallward continued to live in the city, and in May 2001 celebrated his 100th birthday on the lawn at Peterhouse.